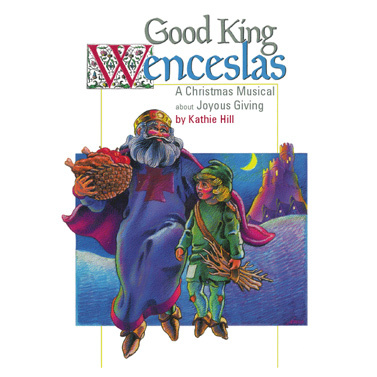 Good King Wenceslas Christmas : Kathie Hill Music, LLC, Making music with and for kids for over 25 years! Released in 1986, this simple musical introduces kids to the medieval king whose generosity was immortalized in the carol bearing his name. But did you know that Good King Wenceslas was a Christian king in a pagan land who advanced Christianity in central Europe? In this Classic, Kathie Hill imagines the knights and ladies-in-waiting celebrating Christmas with godly King Wenceslas. But as he concentrates on giving gifts, his selfish daughter, Princes Wences thinks only of getting them! To set an example the king takes food to a peasant leaving the friar to prepare the nativity play. As Wences reluctantly participates, she is so reminded of the greatest and most generous King that when Wenceslas returns, he finds a princess who has been changed by the Prince of Peace and gospel of Christ. A Performance DVD (available on demand) features a music conference premiere with costume, choreography and drama demonstration. Kathie's Note: Boys relish knighthood, girls love “waiting” in long dresses and you’ll love teaching songs about giving! The Director’s Book includes instructions for props, costumes, movement, lighting, performance photos, study scriptures and benevolence projects to underscore memorable songs like “Be a Hee-Hee-Hee-Hilarious Giver,” Everything That Is, Is His” and “It is More Blessed to Give Than Receive” (also available as Classic Singles). GKW is a simple musical to produce, but produces a powerful message. Licensed Digital MP3 (3x) files with spilt left channel instrumentation/right channel choral vocals and stereo instrumentation only. (No dialogue or solos.). Downloadable original book with songs, script, production notes & piano transcriptions with permission to make 3 copies. Additional copies require purchase of additional 3x license/s. Digital download of an edited Listening CD (MP3) & water-marked Choral/Singer's Book (PDF) - for preview purposes only. Complete script and all songs in lead line with chords. 40 pages. Pristine. A MP3 audio download of stereo recording of 9 songs w/license to make 3 copies - Additional copies require purchase of additional 3x license/s. Downloadable original book with script, all songs in leadline only & activities with permission to make 3 copies. Additional copies require purchase of additional 3x license/s.